Welcome to Musical Monday; the day that we bring you romantic songs with jewelry, gemstones or precious metals in the title or lyrics. 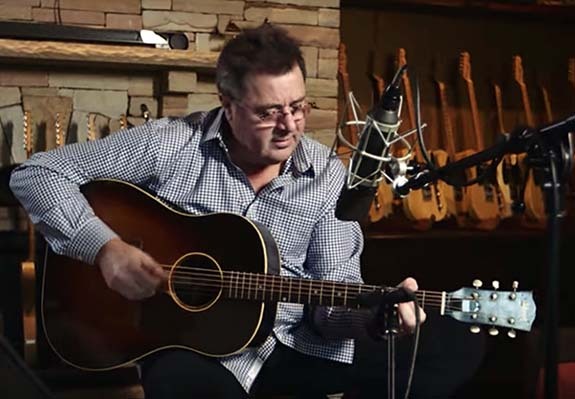 Today, 21 time Grammy winner Vince Gill buys a pretty diamond ring and proposes to the girl of his dreams in his 2016 release, "Like My Daddy Did." He sings, "I found a little girl and I fell in love / She shines brighter than the stars above / I bought her a pretty diamond ring / Asked her, if she would marry me." His girlfriend, however, is skeptical about making a lifelong commitment. Her hesitance stems from a fear that Gill might "treat her like her daddy did." We learn that her dad left the family when she was just a little kid. "He took off runnin', I never saw his face again," she says. Vince consoles her: "There's nothing you could tell me that would change a thing / I still want you to wear my ring." Ironically, Gill promises, "I'll treat you like my daddy did." Gill's dad was loving and kind. When Gill was a kid, his dad took him fishing and never missed any of his ballgames. "There ain't no scars on this heart of mine," he sings. In the end, Gill's girlfriend accepts the diamond engagement ring and they get married. In a promotional video about the song he penned, Gill said, "I love the yin and yang of the story, how he's undaunted by her past. It's sweet." "Like My Daddy Did" appeared as the fourth track of Down to My Last Bad Habit, Gill's 14th studio album. Over the course of his 4 decade career, the singer-songwriter and multi-instrumentalist has sold more than 26 million albums and placed more than 40 singles on the U.S. Billboard Hot Country Songs chart. He's won 21 Grammy awards from 44 nominations and earned the 2,478th star on the Hollywood Walk of Fame in 2012. Born in 1957 in Norman, Oklahoma , Gill was inspired to pursue a musical career by his father, who was not only a lawyer and an administrative law judge, but also played part time in a country music band. At the age of 10, Gill was already an accomplished guitarist. His love for instruments led him to learn how to play the mandolin, banjo and fiddle. After graduating high school, he moved to Louisville to join the band Bluegrass Alliance. In the 1970s, he earned widespread fame as the frontman for the country rock band Pure Prairie League. Gill became a solo artist in 1983 and married "The Queen of Christian Pop" Amy Grant in 2000. More recently, he joined the Eagles on tour, singing lead vocals. Written and performed by Vince Gill.